The Christmas trees of the 1940s varied in size and shape because they were cut straight from the forest and brought home on the top of the family car. This natural tree was most likely on the small size and a bit scraggly. A few branches could be missing or the entire tree might tilt slightly to one side; but to the family that owned it, it was beautiful! Decorations during this time focused in three areas: Angel hair, colored lights or bulbs, and a spectacular tree topper. Since Angel hair was made from fiber glass, tiny bits of glass cut into the skin as it was handled. The strings of lights were wired in a series so if one light went out, the rest did the same. The tree topper was the crowning decoration, and proud families used the same one year after year. After World War II, when live trees became available again, many families purchased Christmas trees that had been grown on official tree farms. These trees were larger in size and more attractive in shape. 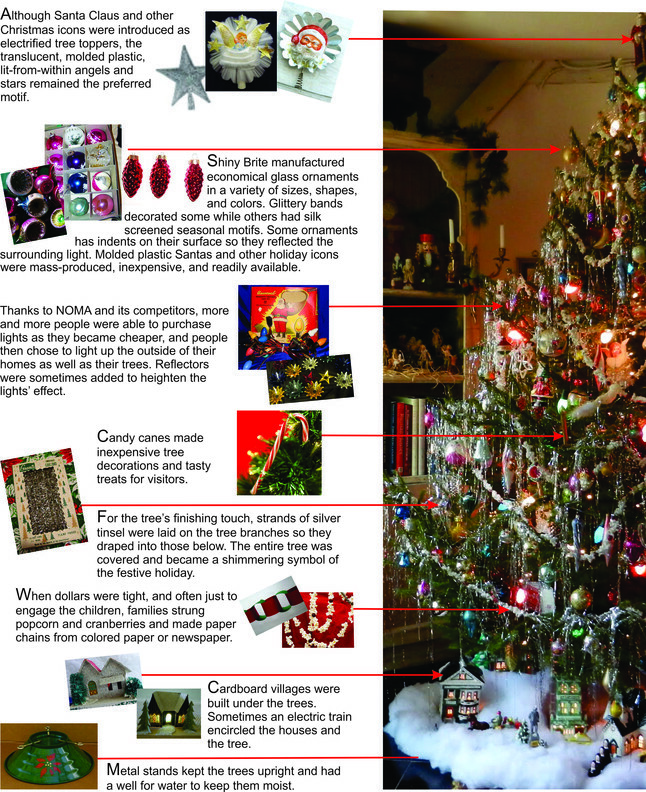 The variety of tree decorations used in the 1950s reflected a comfortable standard of living and the results of new machinery that permitted mass production. The 50s also introduced various kinds of artificial trees. They were available in green and white, and had branches that folded flat. These were usually used in homes where space limitations prohibited a live tree. Aluminum trees were introduced in the mid-fifties and gained instant popularity. The trees were decorated with glass balls and lit by a revolving multicolored wheel. Flocked trees were also popular during this time, but they proved difficult to make until Sno-Flock appeared in 1951 and simplified the process. A device attached to a vacuum cleaner and provided aerosol-dispensed artificial white, pink or blue snow. It sold for $4.49, and the results were advertised to last 30 days and claimed to be fire retardant. No matter what kind of a tree a family had, it was a source of pride. Tradition dictated—in my family at least—a visit be made to each relative’s home to admire their tree-of-the-year. We were always polite, of course; but in our hearts we knew that the tree in our living room was the most beautiful of all. 34 to 36 million Christmas trees are produced each year and 95 percent are shipped or sold directly from Christmas tree farms. California, Oregon, Michigan, Washington, Wisconsin, Pennsylvania, and North Carolina are the top Christmas tree producing states. The best selling trees are Scotch Pine, Douglas Fir, Fraser Fir, Balsam Fir, and White Pine. In addition to evergreens, cherry and hawthorns, were used as Christmas trees in the past. 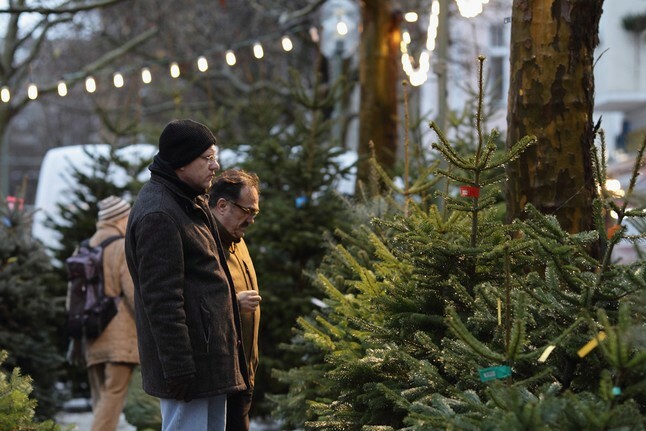 Christmas trees have been sold commercially in the United States since about 1850. Franklin Pierce, the 14th president, brought the Christmas tree tradition to the White House. Thomas Edison’s assistants came up with the idea of electric lights for Christmas trees. Between 1887-1933 a fishing schooner called the Christmas Ship would tie up at the Clark Street bridge and sell spruce trees from Michigan to Chicagoans. In 1912, the first community Christmas tree in the United States was erected in New York City. In 1923, President Calvin Coolidge started the National Christmas Tree Lighting Ceremony now held every year on the White House lawn. The Rockefeller Center Christmas tree tradition began in 1933. In 1963, the National Christmas Tree was not lit until December 22nd because of a national 30-day period of mourning following the assassination of President Kennedy. In 1979, the National Christmas Tree was not lit except for the top ornament. This was done in honor of the American hostages in Iran. In 1984, the National Christmas Tree was lit on December 13th with temperatures in the 70s, making it one of the warmest tree lightings in history. 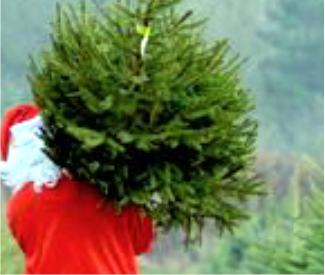 Most Christmas trees are cut weeks before they get to a retail outlet. Christmas trees generally take six to eight years to mature. 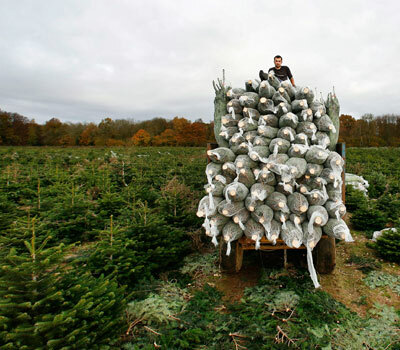 More than 1,000,000 acres of land have been planted with Christmas trees. 77 million Christmas trees are planted each year. Tinsel was once banned by the government. Tinsel contained lead at one time, now it’s made of plastic. The tallest living Christmas tree is believed to be the 122-foot, 91-year-old Douglas fir in the town of Woodinville, Washington.